I've been on the lookout for the perfect summer fragrance for quite awhile. Many are just too heady, too strong, too fragrant. But then I came across Dior Miss Dior Cherie L'Eau Eau de Toilette, and I knew I had found my perfect match. For starters, I'm in love with the bottle. The delicate, utterly vanity-worthy square glass bottle is topped by a stopper with the prettiest, most delicate bow -- such a sweet, sophisticated touch. The scent is lovely and delightful. A floral base of freesia, jasmine and orange blossom opens up to notes of popcorn, vanilla, caramel and patchouli. It's intriguing and warm yet undeniably soft -- and just a few spritzes on your pulse points will last for hours without feeling cloying. I would equate it to Clinique Happy Heart -- it has a warmth that really makes it interesting. Truth be told, this is one of my favorite fragrances in quite some time. One can only hope it doesn't run out too quickly. 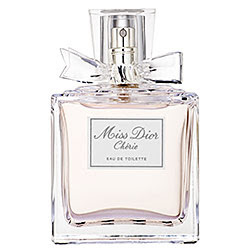 Dior Miss Dior Cherie L'Eau Eau de Toilette is $62 for 1.7 fl. oz. and $82 for 3.4 fl. oz.